[Jakarta, LttW] A few months ago LTTW raised an issue of cave painting’s management being differently practiced both in the Caves of Altamira, Spain, and in other parts of the world, such as in Indonesia—a region rich of cave paintings that are spread from Kalimantan, Sulawesi, Maluku, to Papua. As one of cultural heritages to be preserved, we need to understand that the responsibility of cave painting’s preservation will always be uppermost in the hand of archaeologists; although everyone at all levels each has important roles in contributing to the archaeological literacy’s enrichment—including artists. 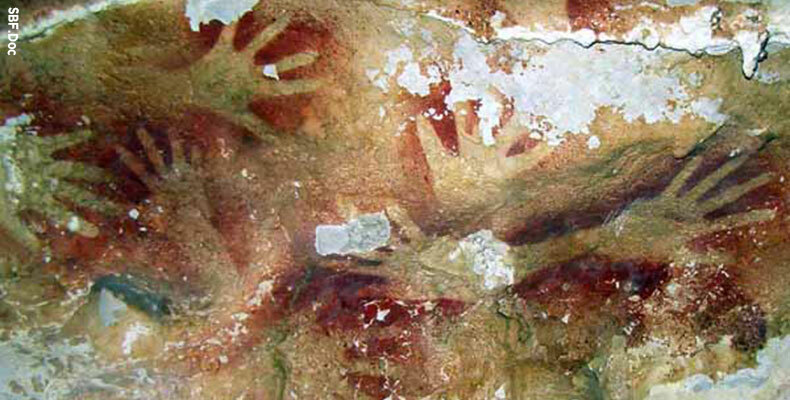 Unfortunately, with hundreds—or even more—neighboring cave paintings, only a handful of Indonesian artists who had done a thorough study on this subject, while in fact, there are still much undiscovered territories archaeologists may learn from the arts’ point of view—particularly from the visual arts. To gain adequate perspectives, I recently interviewed Adikara Rachman, a visual art lecturer at Universitas Trisakti, Jakarta, also the Founder of Maros, an organization he initiated to participate in the development of visual culture in Indonesia. I believe he can help us out throughout the entire discussion on this matter. 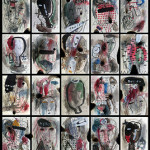 So, I will begin with simple questions: how does art respond to cave painting? 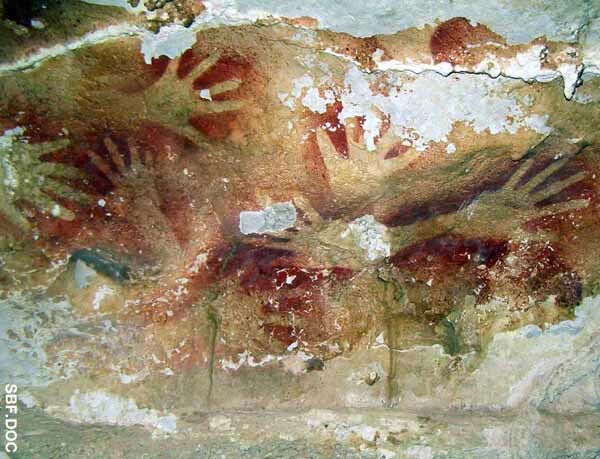 Palm hands drawing in the Leang-Leang Cave, Maros Regency, South Sulawesi. Cave “painting”, cave “drawing”, or cave “writing”? Historical facts told us that cave painting has been with us for at least tens of thousands of years. Archaeological findings such as found in Leang-Leang Cave in Maros Regency, South Sulawesi, Indonesia—famous for their hand prints—put their age in the range of 10,000 years old; long before the term “painting” or “art” were even revealed. Yet, we already seem to be comfortable with terms such as “cave painting” or “rock art” when referring to such wonderful creations; but not to Adikara Rachman. Would there be 10,000 years old art? Cave painting’s terminology as argued by Adikara has pushed me to go further back in time, the prehistoric Indonesia, when Islands located in the central part of Indonesia as Sulawesi and Maluku—used to called the Wallacean Islands—are having rarely connected via land bridges. This longstanding separation from the surrounding continents has limited the ability of animal species, particularly mammals, to travel either into or away from it†. Within this occurred—perhaps ‘harsh’—environment, the question is, could the cave painting meant to be art? However, despite Adikara’s attempt to find a proportion between cave paintings as interpreted artistically and culturally, it is necessary to take issue on Serrano Sianturi’s analysis at the wealth of a cultural manifestation such as cave painting, whose purpose remained inconclusive. According to him, it is the purpose that differentiates the nature of any cultural creation, and therefore, determines whether it can be considered an aesthetic creation—from where arts belong—or a functional creation (Serrano Sianturi). In this context it seems to become even harder to retain a common identification of cave painting as an art. Hand palms of Leang-Leang: more than just an art? The debate over identifying cave painting an art or not, strangely enough, may not have been much discussed among actors in the arts sector in Indonesia. In fact, this does seem to contribute problems—rather than solutions—to the unsolved puzzle faced by archaeologists (and other related stakeholders). Because in effect, perceiving cave painting only from the domain of (Western) art as commonly practiced in Indonesia, tends to confuse and limit our imagination and understanding on its true values along with its tangible visual aspects. To tackle such confusion, Adikara chose to depart from the angles of visual culture, and explained why it should have triggered further responses. “Based upon my desk observation by far,” he continued, “I suppose cave painting is more than just an art; it is more appropriate to be positioned as an aesthetic creation, interpreting from its most universal sense. We probably will not be able to see, moreover to extend, the possibilities one can gain from such incredible heritage, if, in contrast, our mind has been practically grounded in a partial understanding of Western art. At this instant, enriching archaeological horizon is quite impractical.” He ended. Although a further research and study on this subject is greatly required, but Adikara has made a valid point. Cave painting, however, is still an ongoing riddle to be solved; yet, there is an urgency of both preservation and cultivation, knowing that they are facing both natural deterioration and ‘unnatural’ degradation caused by the societies’ collective ignorance. Preserving cave painting may not be the responsibility of the arts and artists; but ignoring it completely is not a very wise move either. Here in Indonesia, the branches of ‘problems’ faced by archaeologists (and other related stakeholders) may root in our own struggle as a nation in comprehending such cultural heritages. Behind the simple term of ‘comprehending’, however, there lurk a wide range of potentials and prejudices, which can only be managed by dialoging it under a multidisciplinary atmosphere. While heritages such as cave paintings could be interpreted in various ways and in mutual concerns, such possibilities are indeed limited by a single direction towards particular meanings—ones that often drawn from partial and separate perspectives. The authorities, in many respects as the ones we rely the most, then have to adopt particular strategies in relation to this; one of which is to begin to stimulate and facilitate multidisciplinary practices, so that the societies could have multi-direction towards the heritages’ values cultivation*, or develop an independent interpretation, as was done by Adikara Rachman. In the end, after gaining more insights particularly on the standpoint of visual culture, cave painting isn’t as ‘outdated’ as it appears; in fact, there are many values attached on every object which still relevance to today’s thinking and behaving, or even goes far beyond. I am making this point by referring to Serrano Sianturi’s thought, with which I would like to end this article. He has written that ‘a thing of the past (especially the thousands years old ones) does not always mean outdated, irrelevance, uninspiring or worth nothing. To the contrary, heritages, in relation to its surrounding contexts, often contain logics and ideals that are healthier than we have today. Our inability to comprehend heritages is a result and evidence of our very little understanding of contexts, coupled with the disconnection between the current and the past logics and ideals’ (Serrano Sianturi).